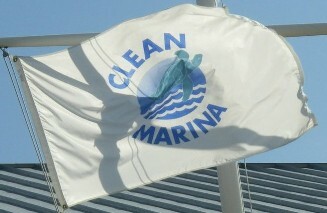 The North Carolina Clean Marina flag has a white field bearing the program logo. Found here (clickable photo halfway down): www.facebook.com/NOAA.NOS.CoastalEstuarineEcology. The blue name "CLEAN" (above) and "MARINA" (below) surrounds a disk of a gradually lighter blue showing three stylized white waves at the bottom; across the disk appears a green turtle, swimming along an ascending diagonal towards the right. When it has been verified that your facility meets the Clean Marina criteria, you will be issued a Clean Marina flag and Clean Marina Certificate, identified on the Clean Marina website (including a link to your website) and you will be able to use the Clean Marina logo in all of your publications." Lake Wylie is an artificial lake straddling the border between N. and S. Carolina. A drawing of this flag can be found at www.lakewyliemarinecommission.com/clean-marinas.asp. Green field, white name, no serifs, "CLEAN MARINA" (top) and "LAKE WYLIE" (bottom) enclosing a yellow ring in the centre within which appears a yin-yang design with horizontal wavy dividing line: top segment, sky blue with white featureless dove flying towards the fly; bottom segment, dark blue with sky blue featureless fish swimming towards the hoist. For good measure two yellow reeds are placed to the left of the disk and a heron looking toward the hoist, to the right of said disk. In the lower hoist appears a simplified rendition of the L.W. Marine Commission logo (see above webpage): a triangle fimbriated white and divided by a white Y-form: two lower segments sky blue, the upper one yellow with a green base. The Lake Wylie Marine Commission, founded in 1987, is "a federally established body of concerned citizens appointed by the governments of the three counties that border Lake Wylie [representing] the citizens of those counties and other Lake Wylie stakeholders to establish public policy and regulations to protect and preserve Lake Wylie and its shoreline, to encourage its safe use and enjoyment, and to protect Lake Wylie as a high quality resource and asset for the region." "The Lake Wylie Marine Commission Clean Marina Program is a voluntary program for Lake Wylie marinas that encourages marina operators and recreational boaters to protect the lake's water quality by practicing environmentally sound operating and maintenance procedures to reduce or prevent pollution of the water." Accepted marinas "are (...) qualified to fly the LWMC Clean Marina flag and use the logo in their advertising."